Preheat oven to 300 degree F. Remove all unpopped kernels from popped popcorn. 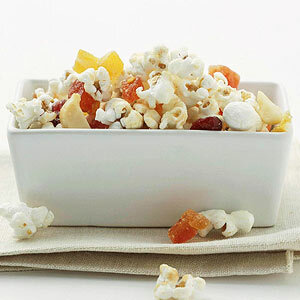 In a large roasting pan combine the popcorn, nuts, fruit bits, and cranberries; set aside. In a small saucepan combine butter, sugar, lime peel, orange peel, and ginger. Cook and stir over medium heat until butter is melted and mixture is nearly smooth (the sugar will not completely dissolve). Pour mixture over popcorn mixture; stir gently to coat. Bake for 45 minutes, stirring every 15 minutes. Remove from oven. Spread mixture on a large piece of foil to cool. Store in an airtight container up to 1 week. Makes about 15 cups (15 servings).